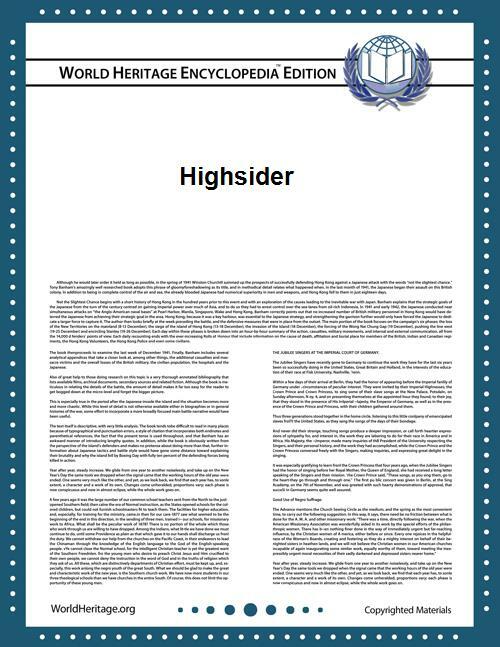 A highsider or highside is a type of motorcycle accident characterized by sudden and violent rotation of the bike around its long axis. This generally happens when the rear wheel loses traction, skids, and then suddenly regains traction, creating a large torque which flips the rider head first off the side of the motorcycle or over the handlebars. Highsides differ from lowsides as follows: during a lowside the rear wheel slips laterally and continuously until the bike falls onto its side (the side that's inside the corner), while during a highside the rear wheel slips laterally only briefly before suddenly regaining traction and flipping the bike onto its other side (the side that's outside the corner, and therefore the higher side of the motorbike). As a result, highsides happen very quickly with little, if any, warning and are very violent. If the wheels are not aligned in the direction of travel when traction is suddenly restored and the rear tire stops slipping, then a highside is likely, depending on how much the bike is turned across the direction of travel and how fast the bike is traveling when the rear tire stops slipping. If the angle is high enough, the bike is moving fast enough, and the rear tire slips and regains traction suddenly enough, the rider has no chance of preventing a highside. Once a tire slips in a curve, it will move outwards under the motorcycle. What happens from there depends on how well the rider is able to restore balance and control. If the tire regains traction after the rider starts to skid while the motorcycle is moving sideways, the tire will stop its sideways movement causing the motorcycle to suddenly jerk into an upright position (and beyond). This movement can easily cause the rider to be thrown off. Because highsider accidents are so much more deadly than lowside accidents, the Motorcycle Safety Foundation recommends that if a rider locks the rear brake at higher speeds and the traction is good the brake should not be released. ^ "You and your motorcycle: riding tips" (PDF). Motorcycle Safety Foundation. p. 36. Retrieved 2009-09-28.